"Hey, nice bulbs, Emily. Oh, and I don't mean that metaphorically." I hate to admit it, but I still get a slight chill during the opening titles of A Night at the Roxbury, if only for the use of the song What is Love by Haddaway. The basis for this sensation stems initially from a desire to reminisce about the early days of the Roxbury sketch on Saturday Night Live, when such guest hosts as Sylvester Stallone, Tom Hanks, and Jim Carrey added their own comedic touch to a concept that got old fast. The 1998 film version is being re-released by Paramount (presumably to take advantage of the same-day DVD release of Blades of Glory) in this "special collector's edition", which will appeal to Will Ferrell's fan base; one that has grown exponentially since the Butabis first hit the big screen. Steve Butabi (Will Ferrell) and his brother Doug (Chris Kattan) are two grown men in arrested development. They spend their nights in various nightclubs, dressing in ridiculous suits and dancing violently, not at all appealing to the ladies. There is one particular club, The Roxbury, they can't get in to, and having jobs working at their father's (Dan Hedaya) flower shop doesn't exactly help their status among the rest of the clubgoers. When Richard Grieco rear-ends their flower van, the guys are finally granted access to the club, where they meet its creepy owner, Mr. Zadir (Chazz Palminteri) and a pair of attractive but greedy women, Cambi (Elisa Donovan) and Vivica (Gigi Rice). Steve and Doug's tight relationship is further challenged by Emily (Molly Shannon), whose pining for Steve tests their brotherly bond that keeps them on the dance floor together. It is easy to see why the SNL sketch wore out its welcome quickly, but the problem with the film is that it was made long after the TV version became irrelevant. Still, compared to the overwhelming number of the show's spin-off films during the late 1990s, this is one of the better efforts. The plot is far from important, but Ferrell and Kattan's mannerisms are, and just watching them act like complete idiots is enough to keep audiences laughing. It's too bad the rest of the cast can't keep up with them; Molly Shannon is as annoying as ever, Palminteri comes across as unnecessarily spooky, and Loni Anderson as their mom goes way over-the-top. Dan Hedaya comes to the supporting cast's rescue, though, giving a manic turn as the Butabis' crazy father. Fans of Ferrell are still going to get quite a bit of mileage out of this material. He's not as much of a madman as he's proven since to be, but one can get an early glimpse of his Ron Burgundy and Ricky Bobby characters. Despite his relative calmness, Ferrell still manages to upstage Kattan in every scene they share, which make up the majority of the film. Kattan on SNL could be awfully funny, and while he does manage to hold his own at times, most of the audience focus will almost certainly be on Ferrell. It's an uneven, yet very funny night out with the Butabis, and one that's well worth a short 81 minutes. Image Transfer Review: This 1.85:1 anamorphic widescreen presentation is a nice upgrade over the previous DVD release. The colors are brighter, and the images sharper and more detailed, with truer black and shadow levels throughout. Much of the debris has been cleaned up as well, as there's very little dirt and grain left on display. Audio Transfer Review: The Dolby Digital 5.1 track sounds like the same one from before, but that's not a bad thing at all. The surrounds are used liberally for the dance music and there are nice directional effects when the Butabis are driving around in their van. The dialogue is crisp and clear, having no problem blending in with the rest of the track. Extras Review: Along with some previews for other Paramount DVDs, there's a 24-minute documentary entitled Score! Reliving A Night at the Roxbury. This piece is a combination of old interview footage and film clips that provide a comprehensive study on the making of the film. Roxbury Rags: Costume and Fashion Guide is nine minutes of discussion with costume designer Mona May about the wild clothing worn in the movie, especially that of the Butabi brothers. Do That Dance! runs for five minutes, and involves choreographer Mary Ann Kellogg and her role in handling the dancing during the club sequences. The last featurette, Making the List, is just under nine minutes and is basically a how-to guide for getting into posh nightclubs. 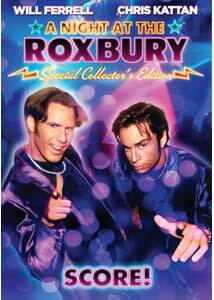 Get your heads bobbin' and crank up What is Love?, the Butabi brothers are hitting the dance floor again in A Night at the Roxbury: Special Collector's Edition. If you've never seen the Butabis' feature-length adventure, or simply want to compare this to Ferrell's later efforts, Paramount's new disc is a nice way to do so, with its slightly improved audio and video and handful of extra features.